I don’t remember who suggested to me that I subscribe to Jeffrey Gitomer’s newsletter, Sales Caffeine. Whomever it was, I’m grateful. Selling is certainly my strong suit, yet it is something all of us who freelance or have our own company have to do. Gitomer has written several books on selling, and markets them through his web site and newsletter. But the free articles in his newsletter are already great value, with good, no-nonsense advice. The secret of selling is four words: perceived value and perceived difference. Two of the four words are the same: perceived. If your prospective customer perceives no difference between you and the competition, and perceives no value (better stated, a greater value) in what you're offering, then all that's left is price - and you will most likely lose the sale. Or if you win the sale, it will be at the expense of your profit. Excellent advice: if we can offer better value to our customers and prospects, the fact that our rates are higher than most, won’t matter. 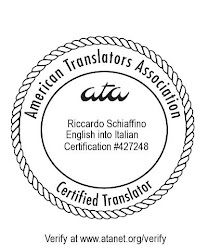 It’s only if we cannot offer better value (or if we cannot explain why what we offer is better value) that we’ll suffer from price pressure on translation rates. I believe that the point about value perception in translation is that you suggest a word rate **before** the customer can evaluate your value. And, most of the time, they cannot, since they do not understand the target language(*). This makes a major difference with a lot of other goods or services you may have to buy. You know (you believe you know) the value of a car before buying it. You also believe you know the value of a lawyer before calling them. I feel it is not the case in translation services. "REALITY: There is no fast way, there is no easy way, and there is no best way. However, there is a better way than thinking of it as closing the sale. And once you understand what that way is, it will change your approach to the sale, for the better, forever.."
Its always there that client don't understand the value of our services but still we have to built such a confidence that they will trust has and this will come once we start applying those rules. Riccardo, you might have picked up on Gitomer from an old blog post of mine or the same place I found out, wherever that was. Corinne, perhaps? In any case, as much as I usually find the world of sales and salesmen irritating, I too have become quite a fan of his. I think quite a few translators could benefit from a jolt of his java. We of all people should know that communication has to be aimed at the target group. It's perfectly right: we have to get our customers to perceive that we're better. We have to explain what it is that we do. I think the problem is not so much that people don't understand the target language (in my case, often they do: it's English) but they find it hard to describe the quality of texts and what these do for them. People ypou deal with directly may intuitively appreciate what you do, but they need to be able to make a case for the expenditure up the line, in project descriptions etc. So we're responsible for giving them words and concepts which they can use to justify getting translations done (and their expense). And that's why we need not just to be able to do the work, but to explain it. As the guys over at LanguageLog love to document, professional writers (journalists) often don't have the slightest clue about language (e.g. they recommend patent nonsense like Strunk & White or make up their own absurd rules). Translators I think can't get away with that. We have to be able to spell out to clients what benefit they will have from a text. And if we're just being schoolmarmy about silly bits of usage, they'll see through it. Guillaume, you're absolutely right. The good thing is: once a customer likes your service, he'll very probably come back because going somewhere else is taking the risk again. Thats true as well. its about your customer getting used to your style, processes and ways.